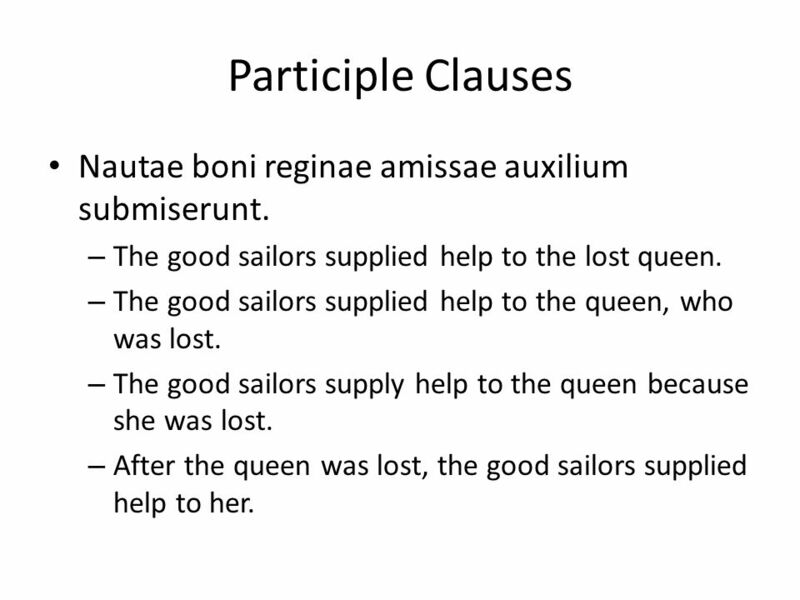 Participles Forming Clauses Lesson XLIII p. 294. 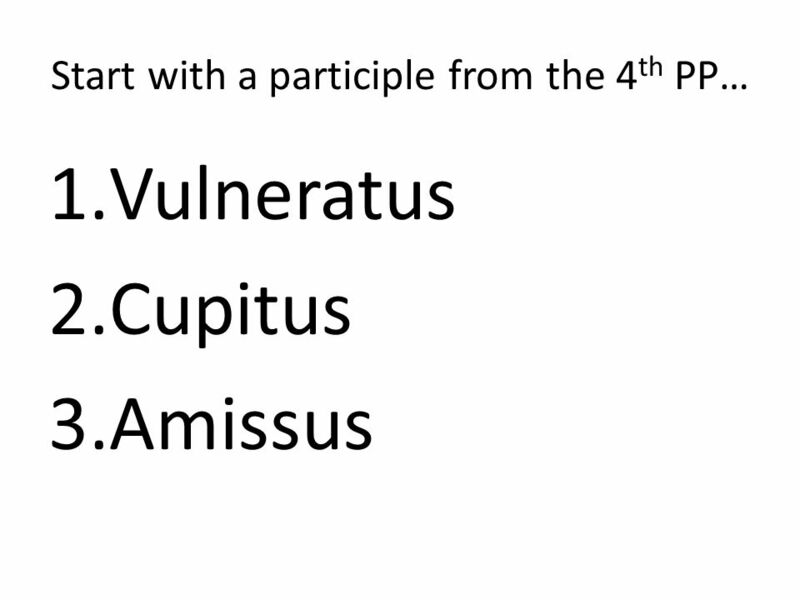 Start with a participle from the 4 th PP… 1.Vulneratus 2.Cupitus 3.Amissus. 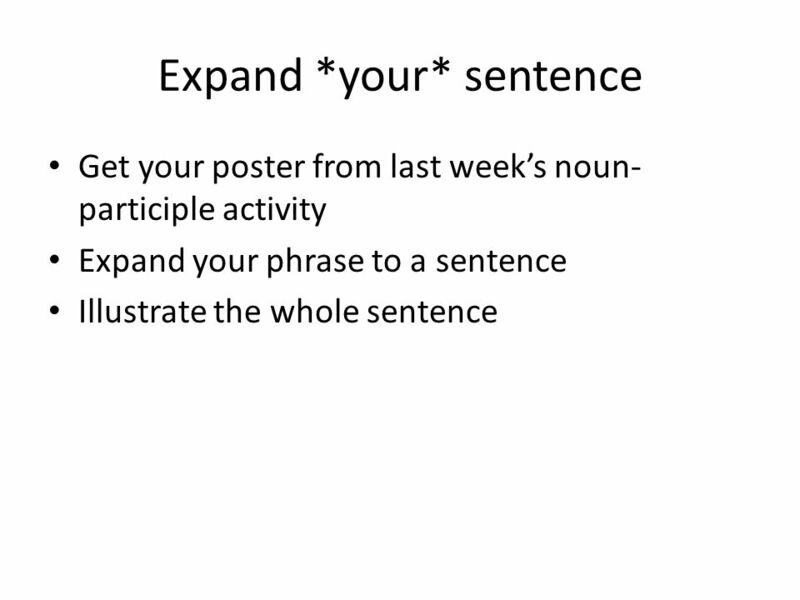 4 Then you can expand it to a clause! 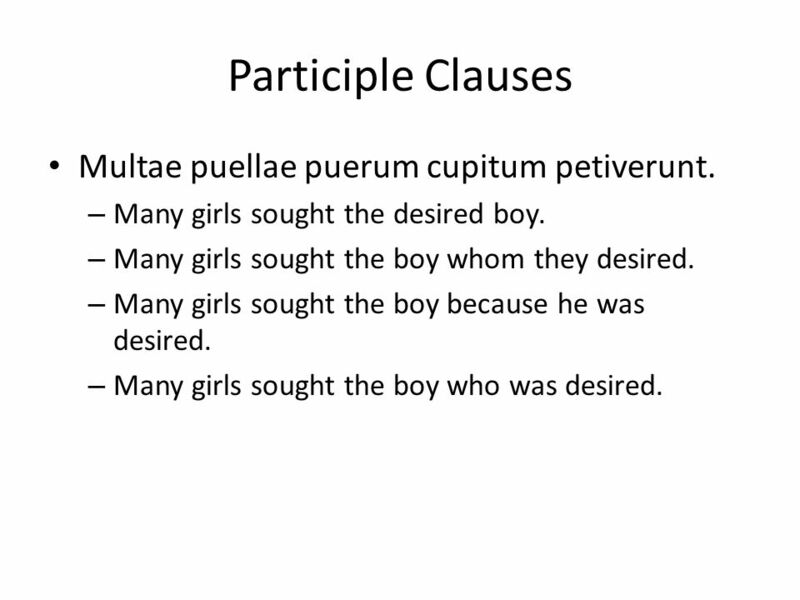 The participle-clause ADDS AN EXTRA ACTION TO THE SENTENCE. That means it functions as a VERB. But it also MODIFIES A NOUN. So it functions as an ADJECTIVE. 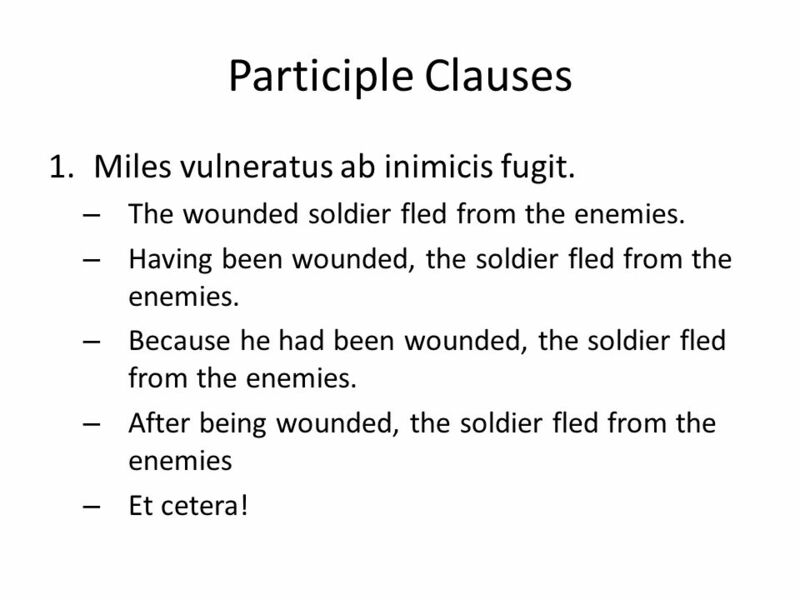 5 Participle Clauses 1.Miles vulneratus ab inimicis fugit. – The wounded soldier fled from the enemies. – Having been wounded, the soldier fled from the enemies. – Because he had been wounded, the soldier fled from the enemies. – After being wounded, the soldier fled from the enemies – Et cetera! 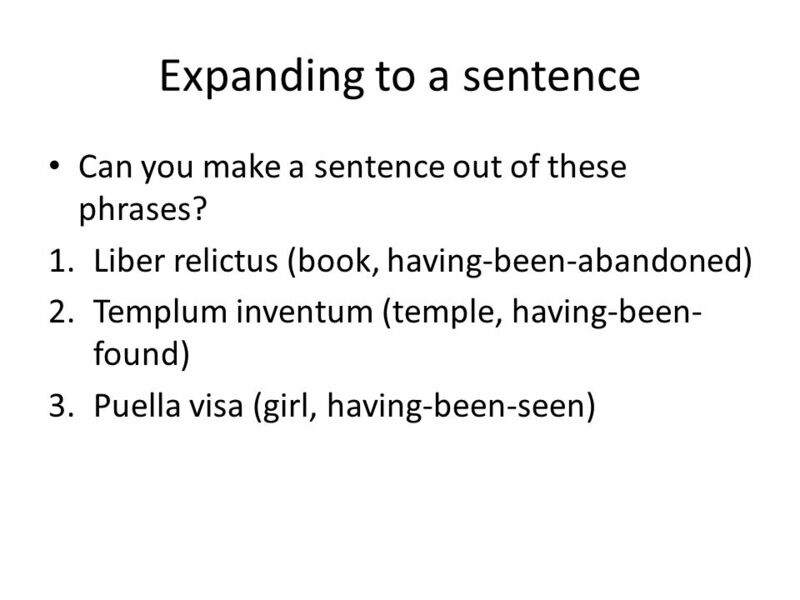 6 Participle Clauses Multae puellae puerum cupitum petiverunt. – Many girls sought the desired boy. – Many girls sought the boy whom they desired. – Many girls sought the boy because he was desired. – Many girls sought the boy who was desired. 7 Participle Clauses Nautae boni reginae amissae auxilium submiserunt. – The good sailors supplied help to the lost queen. – The good sailors supplied help to the queen, who was lost. – The good sailors supply help to the queen because she was lost. – After the queen was lost, the good sailors supplied help to her. 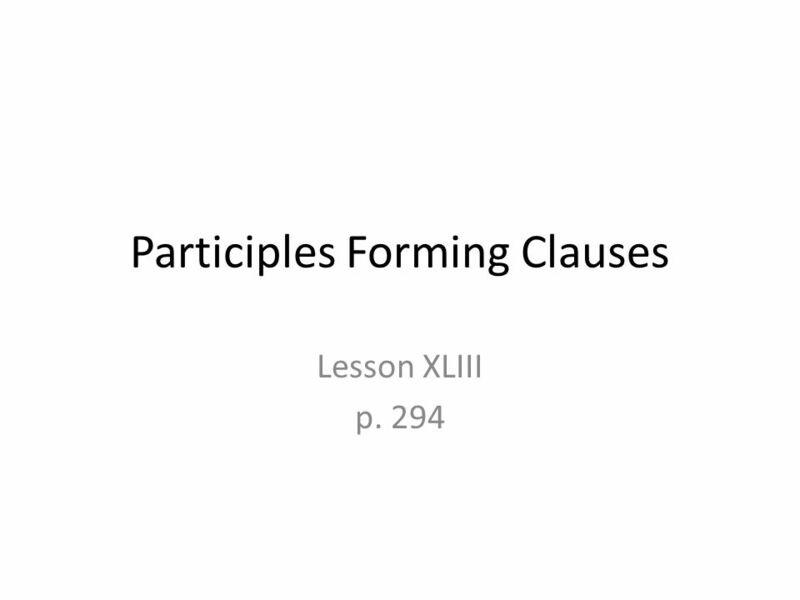 Download ppt "Participles Forming Clauses Lesson XLIII p. 294. Start with a participle from the 4 th PP… 1.Vulneratus 2.Cupitus 3.Amissus." Dependent Clauses: Review Which * although While * that When * because Whenever * before If * what Until * whatever Who * whichever Whom * whose. Ablative Absolute Ablative Absolute grammatically is absolutely unconnected with the rest of the sentence. The most common ablative absolute has an ablative. English Grammar P ARTS OF S PEECH Presented by: Pir Suhail Ahmed. Lesson by Safrianna DeGroat. ADJECTIVE  “a word that modifies a noun.”  Refers to a word class with particular characteristics (describing the noun). 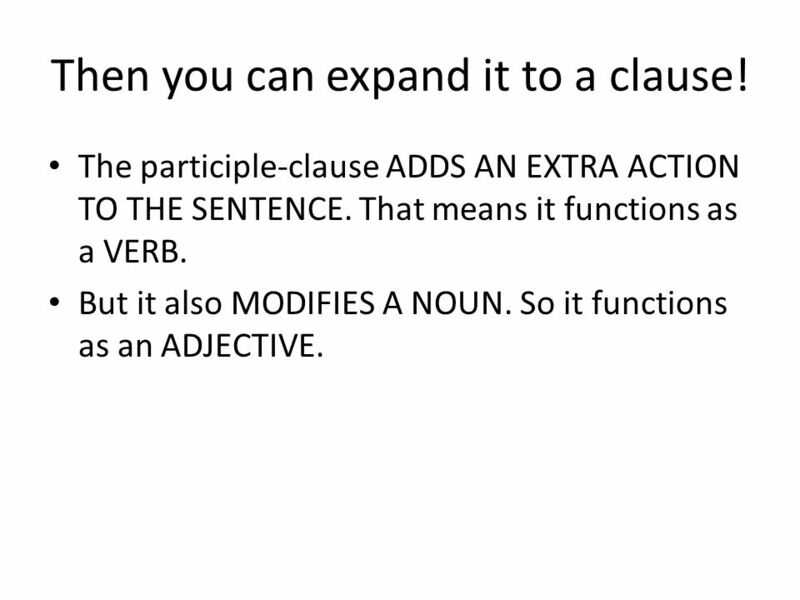 NOUN CLAUSE Noun clauses as the name implies, function as nouns. That is, they are word groups with their own subject and verb that in turn function as. Here are just a few key points to remember. Adjective clause- is a subordinate clause that modifies a noun or pronoun by telling what kind or which one. ADVERB CLAUSES Answer questions like: When? Where? Why? Under what circumstances? 10 pt 15 pt 20 pt 25 pt 5 pt 10 pt 15 pt 20 pt 25 pt 5 pt 10 pt 15 pt 20 pt 25 pt 5 pt 10 pt 15 pt 20 pt 25 pt 5 pt 10 pt 15 pt 20 pt 25 pt 5 pt NounsVerbsPronounsPrepositionsAdverbs. 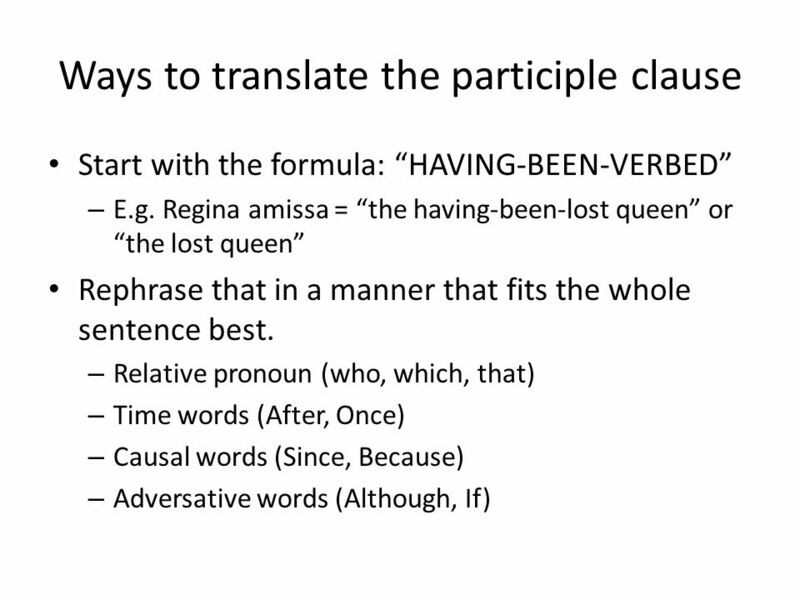 The Phrase and the Clause Adjective & Adverb clauses. Focus On Grammar Book 2, 5 th edition Lesson 11: Adjective Clauses!!! !